By Randy Spencer – Great weather once again and a larger crowd as the Late Models were the main attraction of day two of Frostoberfest at Bennett Chevrolet Flamboro Speedway. The Late Models would be racing Triple 50 lap features sponsored by Grisdale Racing Products while the Mini Stocks and Super Stocks would be racing twin 30 lap features sponsored by London Recreational Concrete Pools and Spas. Twenty five Late Models were signed in and time trials got underway at 3pm. When all was said and done, Brandon Watson who was this years APC Late Model champion set a fast lap of 15.002, while Shawn Chenoweth was next with a 15.042 followed by Pete Shepherd III 15.044, Shae Gemmell 15.131 and Andrew Gressel rounded out the top five 15.161. A Super Stock consi was the first race with nine cars taking green and just six cars advancing. Brandon Passer and Derek Jackson led the field to green. Passer led lap one and got out to a big lead. He would lead throughout to pick up the win. The OSCAAR Modifieds were next for their thirty lap feature. Chris Milwain and A.J. Emms were pole and Milwain led lap one. The cars started to sort themselves out and it looked like a freight train. Milwain continued to lead, he and Emms started to put some distance between themselves and the rest of field. The first caution came on lap eleven when the 36 of Rob Divenanzo was around out of two. Milwain led from the restart. Another caution on lap 18 as Divenanzo and Mike Westwood did what looked like a synchronized spin out of four. On the restart heading into one Cliff Hodgkinson, Jase Cornell and Westwood got loose and another caution was out. Milwain was the leader again while Dale Reinhart and Cory Horner were battling for third and fourth. On lap twenty two, the second place car of A.J. Emms was around in two bringing out a caution. He was battling some over heating issues and he didn’t finish. Milwain led again on the restart with Horner moving up to second. Another caution when the 36 was around. Reinhart and Gary McLean battled side by side and McLean got past for second. With three laps to go the 99 of Luke Gignac got into Dale Reinhart and the two went to the back. Not what Milwain wanted but he got a good start and managed to hold off McLean for the feature win. The first Mini Stock 30 lap feature was next with the top two cars with quickest times in time trials Saturday on the pole. Andy Kamrath and Jason Tolton were pole and led thirty two cars to green. Kamrath led one. With this many cars it would be sure to see cautions. The first one came on lap six with the 77 of Miek Hooper around. Lap ten saw another caution when Erik Dalla Riva was around down the back stretch. Several caution and Kamrath led each time. Three wide action made it exciting but also caused some of the cautions. Dalla Riva was around again down the back and the caution would mean a green, white, checkered finish. Kamrath led and he would pick up the firs Mini Stock feature win. The first Late Model feature and twenty four cars would take green. The top two in time trials, Brandon Watson and Shawn Chenoweth were pole. Watson led lap one. Several cars were involved as the cars made their way into turn one. This would be a taste of things to come. Several cautions started to way on everyone’s patience including the fans and the race director. A couple of suspect restarts and the games continued. I should have probably counted cautions, easily was in double digits. As the race continued to did the cautions and even a couple of reds. The second red flag came out as the 97 of Michael Gold got loose and rode the wall and he sustained some very serious damaged. He was out of the car and ok. He said later his arm was very sore but not broken. On the restart, Andrew Gressel took the lead from Watson. Another caution as J.R. Fitzpatrick, Kevin Albers and Jeff Ruddy around down the back stretch as they got into the speedy dry. On the restart Gressel was the leader. he would battle Watson and eventually Watson retook the lead. As the checkers flew it was Watson followed by Gressel and Hudson Nagy. The race took one hour and sixteen minutes. The race director was very upset at what had happened so he set up a drivers meeting before the second Late Model feature. Next was the first thirty lap feature for the Super Stocks. Treyten Lapcevich and Ken Grubb were pole and twenty six cars would take the green. Lapcevich led one. A caution on lap four as Jaeger McMaster had something break and he couldn’t continue. Another caution as the cars would head into 3-4 on the restart. Trevor Collver, Miles Tyson, Brad Collison and Joe Trafford were involved and Tyson was off on the hook. A red flag on lap seven as the 44 of Joe Arsenault blew an engine and laid down some fluid. Another caution but after that the cars settled in and Lapcevich was leader and built a half straight lead and would win the first feature. The second fifty lap Late Model feature was set and we were all hoping a race that had far less yellow flags. James Horner and J.R. Fitzpatrick were pole. J.R. led one and turned that into a big lead. A caution on lap eight as Hudson Nagy had something break and hit the wall out of four. Fitzpatrick, Chenoweth and Pete Shepherd were 1-2-3 and they broke from the pack. Chenoweth made an aggressive move and was into second. A caution on lap 48 meant a green, white checkered finish. Fitzpatrick would continue to lead and would pick up the win followed by Chenoweth and Brandon Watson. The second Mini Stock feature was next Jason Leblanc and Mike Hooper were pole with Hooper leading lap one. A few cautions early in this one with some five wide action and it looked like bumper cars as several cars were bouncing around and off each other. Bryan Wilson was the new leader through 3-4 on lap six. A caution on lap 19 saw the 07x of Chris Pendlebury get into Russ Aicken. On the restart Andy Kamrath battled Scott Mast. A caution on lap 27 meant another green, white, checkered finish. Kamrath led on the restart. Another caution but Kamrath led once again and would sweep the night picking up both Mini Stock feature wins. The second Super Stock feature was up and Derek Jackson and Steve Book were pole. Another attempt at bumper cars as the majority of the field mixed it up on the front stretch. Kenny McNichol Jr. was the leader early. Caution would breed cautions all night long and this feature wasn’t any different. Kevin Gallant, Jeremy Bean and Shawn Hewitt mixed it up and a red as emergency crews checked out the drivers involved. The race would restart and McNicol would continue to lead and hold off Andrew Ferreira and pick up the win. The final race of the night was the third 50 lap race for the Late Models. Only 18 cars made the call for this race due to all the carnage in the first two races. After receiving some damage to the rear of the car in an early race, Shae Gemmell would start inside of the second row and lead lap one. The cars settled in for some good racing finally and got some laps in. A mix up however on lap 37 saw another red as several cars mixed it up in one. Jeff Ruddy was off on the flat bed. The Ironman Gary Elliott got airborne and he was pretty slow exiting the car to be checked out by emergency personnel. He was ok the next day, very sore after taking a hard hit and received a severe rib and vertebrae compression. Last time Gary got that was about 18 years ago and he said it took almost four years to totally heal. Lets hope he heals quicker this time. He said the car is fixable as he goes for consecutive start #800 this Saturday at the Autumn Colors event at Peterborough Speedway. Gemmel continued to lead on the restart. Fitzpatrick was second by Brandon Watson got past on lap 48 and as the checkers flew it was Gemmell followed by Watson and Fitzpatrick. That closed a very exciting weekend of racing at Bennett Chevrolet Flamboro Speedway. When all was said and done everyone gathered in the pits for trophy and cheque presentations!. Check the results below. 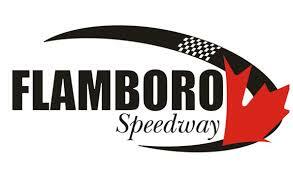 Thanks again for the main two sponsors of this event and for your continued ongoing support of Flamboro Speedway, Grisdale Racing Products and London Recreational Concrete Pools and Spas. Thanks to Derek Smith, http://www.racepulse.com, Mike Kiers http://www.cableguyphotos.com and Peter Anderson for the photos and to Ingrid Hartman for the great video showing all the great racing and carnage throughout. You can follow her on youtube, petalpower 51.